The Story of Earth: The First 4.5 Billion Years, From Stardust to Living Planet; by Robert Hazen. 2012. Viking Books. $28. The first post/book review I failed to provide any maps. And, there are lots of maps I could have posted. Many places around on our planet illustrate the changes our planet has undergone in the brief 4.5 billion years our planet has been in existence. With this post, I’m going to provide a few maps which will help us see the geographic distribution and variety of sampling locations on our planet which showcase the information we have access to. I’m going to begin our journey where the author began his journey of study of the Earth’s geology. Our first stop is Cleveland, Ohio. The author’s boyhood home is near Cleveland. Within the environs of Ohio’s 2nd largest city, many sites contain Devonian age (420-360 MYA) aquatic fossils. One can visit places in Montana where the rock layer sequences are physically accessible. A visitor could literally lay their hands on rocks half-a-billion years old. Later in our author’s academic life, Dr. Hazen would take a field trip to the community of Nahant, Massachusetts. Rare shell-building fauna are exposed in Cambrian age layers (540-500 MYA) on this tiny spit of land hanging off the coast of Massachusetts. I don’t want to limit our experience to the United States, though. Yes, the U.S. does have an amazing abundance of fossil of all types, representing over 500 million years of life on Planet Earth. However, the U.S. is not alone in its abundance of fossil-bearing rocks. In the southern province of Guizhou, China, we can travel back to the end of the Endiacaran Period, 580 MYA, and examine sponges with hardened spines. Creatures were beginning to utilize minerals in solution for building themselves little protective shells. In the Anti-Atlas mountains of western Morocco we can find more evidence of Ediacaran Period sediments. Near the settlement of Anoun’Tout, Morocco, and near the Souss River, fossil-bearing rock strata provide millions of years of carbonate evidence. But, at 500 MYA, we have only scratched the surface of Earth’s lifespan. Can we go farther back than 500 MYA? Are there places we can visit which can yield more clues to the geologic and perhaps biologic history of the Earth? After all, 500 MYA is only about 1/9th, 11%, of the Earth’s 4.5 billion year lifespan. As it turns out, yes. And, as it turns out for Canadians and U.S. citizens, we don’t have to leave North America to find our evidence. 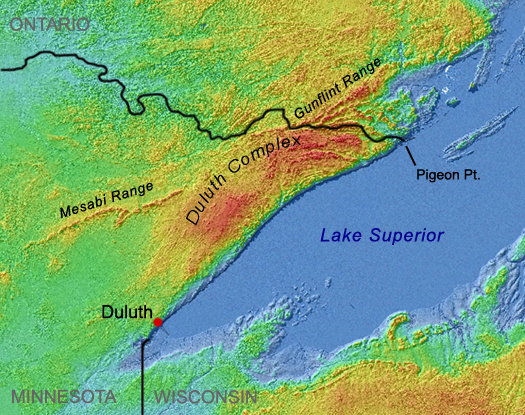 In the Gunflint Range, a thin offshoot of the Duluth Complex, located on the western shore of Lake Superior, we can find what paleontologists say are cherts which hold the oldest “absolutely unambiguous fossils of photosynthetic cells on Earth.” (173) Ancient microbial fossils have been dated back 1.9 billion years. However, if we really want to go as far back in time as possible, to locate the oldest known evidence of ancient microbes, of photosynthetic microbes, and essentially life, we could visit Shark Bay, Australia. I know what you are thinking: Australia gets all the cool stuff. Shark Bay, Australia, is home to stromatolites. The living stromatolites of Shark Bay are so unique and peculiar this place is has been recognized as a World Heritage Site. These stromatolites tipped-off paleontologists that other structures found around the world were the result of microbes building reef systems. Analysis of these reef systems have provided dates going back as far as 3.5 billions years. Finally, to wrap up our small journey here I mention the Deep Carbon Observatory. Unlike a stellar observatory, or a space-based observation platform, the Deep Carbon Observatory (DCO) represents an international coalition of organizations and scientists pooling research interests to better understand the role of Carbon on a planetary scale. We can visit their web site, but their physical aspect is distributed among the Univesity of Rhode Island, Rensselaer Polytechnic Institute, and the Carnegie Institution of Washington. The DCO also enjoys global support from a network of partners (map) and community member who contribute towards research goals.